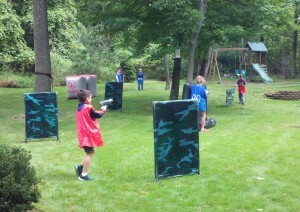 Birthday Parties – Laser tag parties are a great way to entertain a group of 6-18 rowdy boys or active girls ages 7 – 13. We provide all of the necessary equipment, guns, team identifiers, and barriers. Our game instructor will organize the games and ensure everyone is having a fun, safe time. 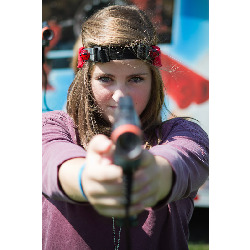 Location – Our laser tag equipment is designed to work both indoors as well as outdoors in full sun. 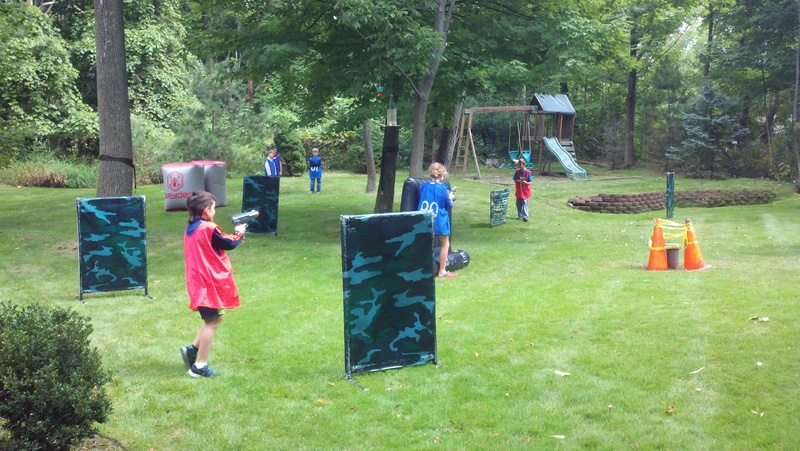 Outdoor Laser Tag – Even small yards can accommodate a laser tag party. Indoor Laser Tag – Winter games can be played indoors a rec center, school, church or any other indoor area with an open space of at least 40′ x 40′. Our guns weigh less than 1lb, which is great for younger players. Build teamwork and fellowship with an exciting sport that provides safe and active fun for all ages! Perfect for parties, family events, corporate retreats, outdoor activity venues – anywhere with some open space and a group of people. In its basic form, laser tag is a competitive shooting game similar in principle to a video game, but far more interactive. Each player has a laser tag gun with a hit sensor. The players try to hit members of the opposing team by shooting at the other players’ gun. Game rules can be simple (free-for-all) or highly complicated (structured teams with specific roles and various special rules). Similar sports include airsoft and paintball. However, unlike these sports, our laser tag equipment works at much longer ranges, enabling greater teamwork and complex tactics, while maintaining safety and a family-friendly environment. Because the beams from our guns are completely harmless, our laser tag is especially beneficial to venues where long-range shooting is possible and families are a vital customer group. Like many tactical games, laser tag is easy to learn and difficult to master. Reflexes, quick thinking, good strategy, relying on teammates, and athleticism all play a role in becoming a champion laser tag competitor. Private Parties $279 for two hours – Includes 10 guns, game instructor and 10 barriers. Corporate Events and Schools $399 for two hours, $125 additional hour- Includes 10 guns, game instructor and 20 barriers. Up to 100 players per hour.